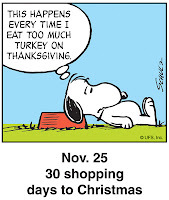 Enjoy the counting down the days until Christmas with the Peanuts gang, one day at a time, starting Friday November 25 on the FiveCentsPlease.org home page. 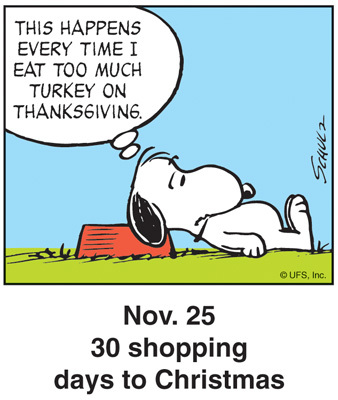 The Peanuts Christmas Countdown panels are a series of single-panel comics distributed to newspapers and other media, and we're pleased to present them on FiveCentsPlease.org. Visit our home page each day for the latest panel... and don't put off your holiday preparations until too late!